Make a chocolate stout cake! This wasn’t just any stout beer …it was a stout made by Chuck, a graduate student in our lab, who is soon to become Dr. Chuck. In my husband’s opinion he already deserves a PhD in beer making. We like to think that growing bacteria in our lab on a regular basis helped him master the brewer’s yeast, but maybe that’s just wishful thinking. What matters is that Chuck has been producing amazing beer, and he often shares his favorites with us. I love to cook with beer, so when he gave us a couple of bottles of his oatmeal stout I immediately reserved one to make this cake. As an added bonus, it gave me a chance to use this very cool baking pan, that was sitting ignored in our kitchen for way too long, from my cake-phobia. Heat the oven to 350°F. 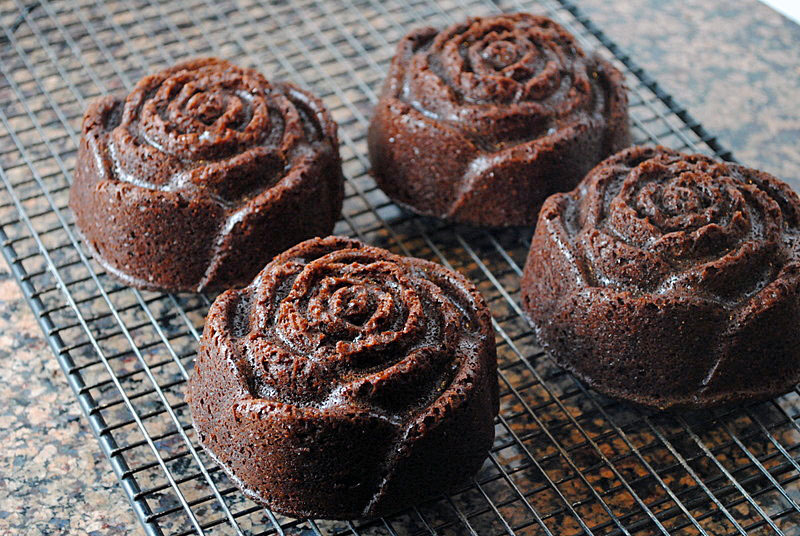 If using a bundt type pan (or the flower pan I did), make sure to coat all the ridges with melted butter, using a brush. Bring 1 cup stout and 1 cup butter to simmer in heavy large saucepan over medium heat. Add cocoa powder and whisk until the mixture is fully smooth. Allow it to cool slightly. In a large bowl, whisk flour, sugar, baking soda, and 3/4 teaspoon salt. In another bowl, beat eggs and sour cream until blended, preferably using an electric mixer. Add the beer-chocolate mixture to the egg- sour cream and beat just until combined. Add flour mixture and beat briefly on slow speed. Using a spatula, fold the batter to make sure everything is well mixed, with no clumps of flour remaining. Pour batter into prepared pan. Bake cake until tester inserted into center comes out clean, 35to 40 minutes for a single cake, or 25 to 30 minutes for a 6-single cake pan. Transfer cake to rack; cool completely in the pan, then turn cake out onto rack. Serve with a dust of powdered sugar on top, if so desired. To my taste, this cake is close to perfect! The bitterness of the beer cuts any excessive sweetness, making this chocolate cake a “grown-up” dessert. The original recipe called for a ganache coating, but I opted for a light dusting of powdered sugar instead. « MY SECOND GUEST BLOG FEAST! I remember that flowered baking pan – was it in one of your in my kitchen posts? Or am I just making that up? LOL. These cakes are simply gorgeous!!!!! I like that you chose the dusting of powdered sugar in place of the ganache. I think it looks very classy. And congrats to the soon to be “Dr.” That’s always such an exciting moment. 😉 My guess is that he did pick up a thing or two from you guys that helped his beer making along the way. I love a good chocolate stout cake…the two compliment each other so well. And i bet it’s even better with homemade stout! during my PhD in Brazil, our lab also worked with yeast – Saccharomyces cerevisea – I loved the smell of their incubator – the yeast grew at 30 C, and smelled great. I worked with Proteus mirabilis, my incubator was a different one, kept at 37 C and I won’t tell you what it smelled like because this IS a food blog, after all…. My husband has been making beer since last summer, huge hit with everybody, stout and bitter are big favourites. I made a stout chocolate cheesecake from Closet Cooking recently, now I must do this cake too. Chuck made bitter beer, some type with live yeast still in it – I don’t drink beer, but Phil and a friend of mine (hi, Cindy!) were raving about it. “Too big for a single person”? I don’t think I’ve ever heard that said in my presence before. Dr. Stout – he’s good for what ales you! HA! God, I crack myself up. 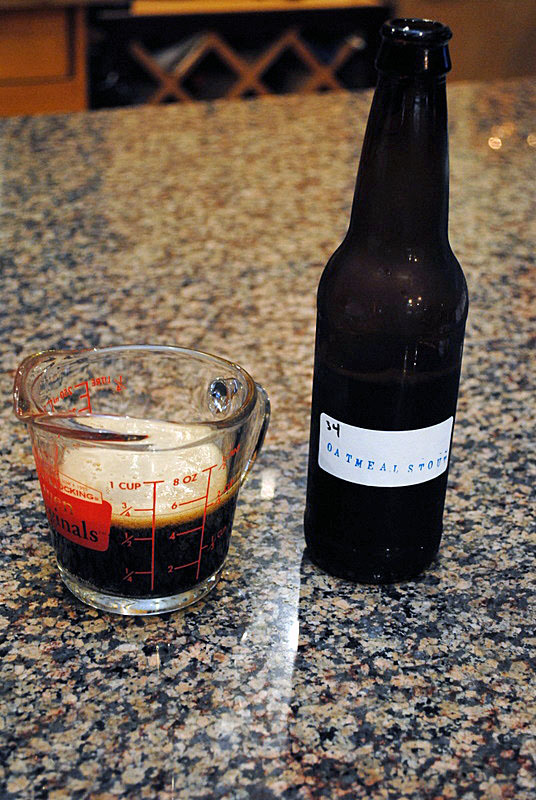 Hey, stout makes a really interesting granita if you ever find yourself with another bottle to spare. It’s especially fun if you serve it to children, who bolt it down thinking it’s ice cream. They you watch the look of dawning horror on their faces as the bitter notes take over the chocolate ones. And then the adorable staggering around and puking behind the curtains! Oh, to be young again…. But seriously, stout granita is cool. For us more sophisticated types. Although your cakes do look fan-freakin-tastic! Personally they’re a bit on the small side for me (and by “bit” I mean by a factor of 7), but otherwise it’s something I’d be proud to say I browbeat my wife into making. And you can’t get much higher praise around here than that. You just crack me up every single time! And I ALWAYS learn some new word from your comment – “browbeat” – that’s a new one for me, had to ask hubby for the meaning. Wow, now I’ve never baked with before before! I’ve added it in for cooking chilli but you’ve know opened up my eyes to new possibilities! I’m not a beer drinker so tasting different varieties may now work for me. I’ll just have to follow your recipe exactly and impress my friends! Ooops sorry, that was baked with beer before! I’m using my handheld to reply and the print is tiny! You know, the ganache in this cake I think would be like wearing running shoes with a skirt. Not a good match. I have stout, I have chocolate. I don’t have pretty pans. Oh well, two out of three ain’t bad. You do NOT have pretty pans? Who ARE you, Mr Rufus? Mr Greg Rufus? I must call Katherine right away! That rosette pan makes a beautiful cake, Sally. 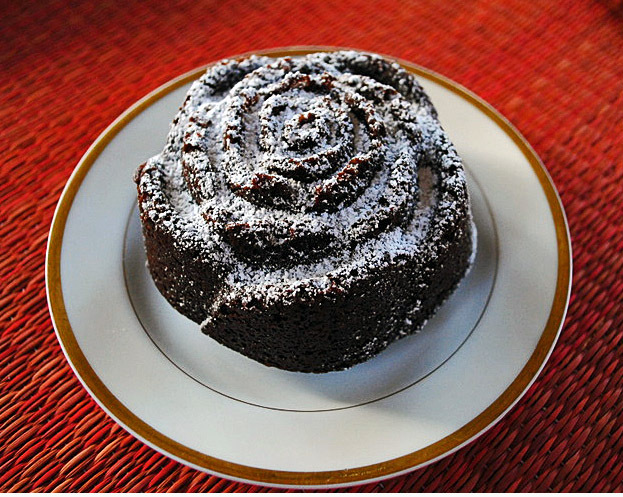 Sometimes I mix cocoa powder with powdered sugar to dust with when I’m baking chocolate goods — I like the taste better than plain white and it is still lighter in color to contrast with the cake. Great recipe! Stout is wonderful in cakes, and I love that pan! What festive cakes! Congrats to you for baking them and for the soon to be Dr. Chuck for brewing his own stout! Thanks, MC! It is always nice to see a student go from the very beginning stages to getting a PhD – and Chuck’s journey towards his degree has been wonderful to be a part of. Very pretty presentation Sally and they sound delicious. THanks so much, Barbara! Hope you are doing great…. Oh, Beautiful cake, Sally!! I have been thinking non-stop of chocolate stout cake lately, and yours are truly beautiful! I love the cake pan, too! I have that same pan somewhere. The last time I used it something stuck and that was the last try. I’ll dig it out and give this a try. I’ll never find beer as soon-to-be Dr. Chuck’s beer but I’ll do my best. That tip of brushing melted butter inside the pan works great – believe me, I am a cake disaster in human form…. Delicious! 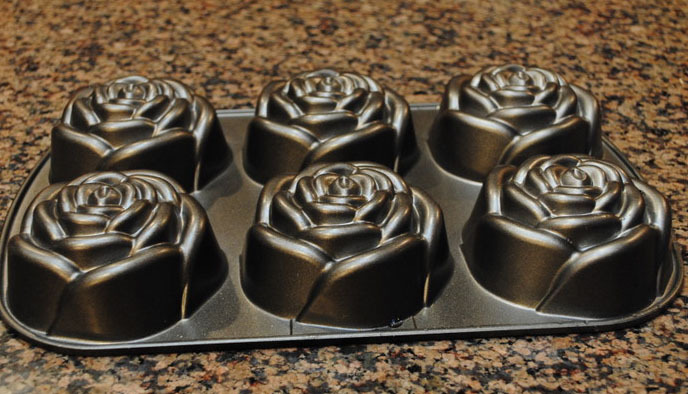 I love beer and chocolate cakes, and the rose pan is gorgeous – I have the matching one to that, with the assorted flowers! wow, wow, wow, what have we here?!! Some of my favourite ingredients coming together in a gorgeous, silky, chocolaty delight… I think I’m in heaven right now… I tend to use Guinness for stout but would love to know a Dr. Chuck 😉 sounds like he makes awesome beer! The prettiest chocolate stouts ever! It looks so delicious and tempting!